Physiotherapy – or physical therapy – places full and functional movement at the heart of what it means to be healthy. It involves treating patients of all ages with a range of illnesses and conditions, including those with back and neck problems, sports injuries, arthritis, or those recovering from strokes and operations. The methods employed include exercise therapy, manipulative procedures, and a variety of electrical treatments. Physiotherapists may be part of a multidisciplinary medical team that includes physicians, nurses, speech and language therapists, psychologists, occupational therapists and social workers among others. Alternatively, they may work from clinics or specialise in particular areas of the discipline. Physiotherapy: The course for you? Physiotherapy is both physically and academically demanding and you will need to have considerable emotional stability and strong communication skills. Visiting a local general hospital or other area where physiotherapists work will give you a good understanding of what exactly is involved. 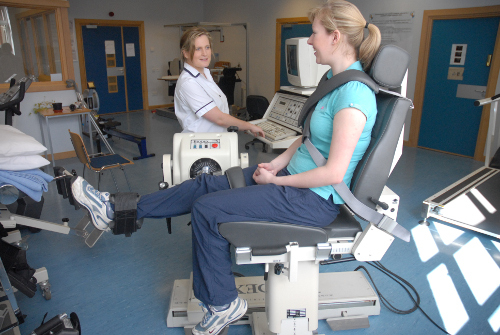 Physiotherapy is based in the Trinity Centre for Health Sciences in a purpose built complex at St. James’s Hospital. This complex houses other health science disciplines and allows physiotherapy students to share courses with those in the other health sciences to give a multidisciplinary approach to studying and working. The centre is about 3 km (2 miles) from the main campus and is beside a Luas station on the line running between Tallaght and Connolly Station in the city centre. All students will have clinical placements at Trinity’s associated teaching hospitals of St. James’s and AMNCH in Tallaght, where there is an established expertise in most areas of physiotherapy. These placements allow students to gain experience in some of the specialist areas of physiotherapy including neurology, respiratory care, coronary care, orthopaedics, women’s health, care of the elderly, sports and out-patients. Successful completion of the course entitles you to membership of the Irish Society of Chartered Physiotherapists, the accrediting body for physiotherapy in Ireland. Physiotherapists are sought throughout the world and you will be able to work with a wide range of conditions or to specialise, as you wish. There is also great scope for you to continue to develop your skills and expertise in areas such as manipulative therapy, sports injuries, neurology, cardiology, respiratory, research, education, management or private practice. The major objective of this four-year course is to enable you to become a competent professional with the ability to work independently with patients. There are two components to Physiotherapy: theory and clinical practice. In the first year the emphasis is on laying a foundation of theoretical knowledge and the second year introduces students to the clinical skills and procedures used by physiotherapists. Clinical sciences are taught mainly in the second and third years. In the third and fourth years students spend up to fifty percent of their time on clinical placement. In the fourth-year, students have an opportunity to develop specialist knowledge in a particular area of physiotherapy and undertake a research project. In first and second year you will have approximately 20 hours of teaching each week, divided between lecture and practical classes. Biomechanics and Movement – includes procedures to improve strength, mobility and balance. Electrotherapy Procedures – includes the use of electrotherapy to alleviate pain, improve circulation and re-educate muscles. Manipulative Procedures – includes the use of soft tissue massage and manipulations to improve mobility and improve circulation. Exercise Therapy – the use of exercise in prevention and treatment. You will also start to study various conditions and specialities frequently seen in physiotherapy, such as respiratory conditions and musculoskeletal conditions. At the end of second year you will start clinical placements under the supervision of skilled and experienced tutors. These may be taken in hospitals, clinics, day centres or within private and community practice. In the third and fourth year half of the time is spent on academic studies and the other half on clinical placements in a variety of settings both within and outside the Dublin area. In fourth year, the first term will be spent on two clinical placements. In the second term you will undertake an investigative project and study the following subjects: sports and exercise medicine, ergonomics, professional issues and advances in physiotherapy. End-of-year written examinations and tests in certain subjects, such as anatomy, make up the theoretical assessment structure. There are a number of submitted assignments in the third and fourth years. In addition, you will be continuously assessed during your clinical placement and will have practical exams on the skills element of the course, including your assessment of a patient while on a clinical placement. Students will be required to undergo Garda Vetting, see https://www.tcd.ie/students/orientation/undergraduates/garda-vetting.php for further details. Note: Students on placements outside Dublin will have additional travel costs.